Have you had enough of opening a nice bottle of wine only to have it go bad so quick? Are you looking to bring out the best taste and flavor for your wine? 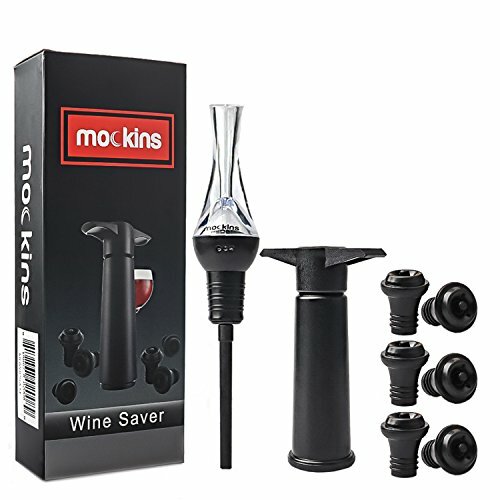 With the mockins all-in-one wine saver and aerator accessory set you'll be able to drink and sip your wine as you please without having the pressure to finish a bottle or spill any out. - Easy to use. Just pump till you feel resistance and you're all set. - Made from durable ABS plastic. - Pump is 4.7" X 2.7" X 1.1" in size. - Made from tough Polypropylene plastic with a rubber base. - Created with small air chambers to infuse the optimal amount of air using the Bernoulli Effect. - The unique design of the aerator pourer allows for an easy and mess free experience. - With the ergonomic slant creating a clean flow and the tappered rubber bottom making a full seal, you can just focus on enjoying your wine. - Aerator is 8.6" in length. - Made with durable rubber. - Reusable stopper is 1.5" X 1.3" X 0.7" in size. We want you to have great tasting wine! If for whatever reason you are not 100% satisfied with your all-in-one wine accessory kit contact us and we will resolve any issues you may have.